This component video adapter cable runs through a D-sub 15-pin type VGA connector for projectors, other component video compatible device using D-sub 15-pin connectors for inputs/outputs. Constructed of three individually shielded miniature 75-ohm coax type cable with 3 RCA male on one end with standard VGA in d-sub 15-pin male on the other end. Heavy-duty molded strain relief provides increased flexibility and durability for transmitting high resolution video signal through for operation. [Note]: Both of your video source device and the receiving destination end or display equipment need to be able to support component RGB/YUV type video signals in order to use this adapter cable. 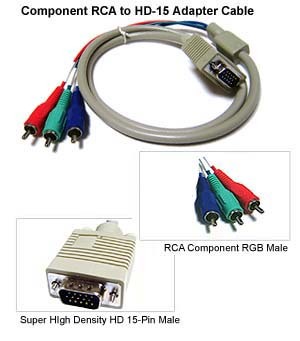 The 15-pin VGA end of this adapter cable remains carrying the same component RGB/YUV type video signal from input. For converting component RGB/YUV type video signals into VGA or RGBHV type for LCD monitor or projection display, you will need to use a converter such as our AV-4, AV-7 or AV-400 model. Bridges the connection gap between component RGB and 15-pin VGA connector. Great for passing the RGB,RGsB,RsGsBs or component YPbPr video and sync signal through a D-sub 15-pin VGA connector. Integrated interference resistant ferrite cores for improved signal isolation and enhanced system electromagnetic compatibility. Individually shielded coax lines protect against harmful EMI/RFI. 75-ohm impedance RCA terminations minimize signal reflections. Quintuple coax connector for standard high definition 75 Ohm inputs. Heavy-duty molded strain relief provides flexibility and durability. Foil and braid shield for high-resolution images.